Smoking is prohibited in the museum, since the most of architectures here is made of wood. In case that you smoke, please use the designated smoking area which is located nearby “Cannon for signaling noon”, in Center zone. In the interest of well preservation of properties, please do not touch accessories or exhibits in the architectures. We do not have slippers in the architectures. Please refrain from running around in the museum, or lean over windows for your safety. When you eat or drink something, please use “Old Warehouse-style Rest House” in East zone. In the interest of maintaining views of the gardens in the museum, please do not enter grass areas of gardens or break a branch of tree. Collecting plants in the museum is prohibited. Entering the museum with your pets or playing games as catch in the museum is prohibited. In the interest of preventing accidents, we may confine the admission in case of congestion. As for sketch in the museum, see “Sketching” for your information. Also, for photography, see “Photography/filming by the general public”. Please do not bring fires in the museum, since the most of architectures in the museum is made of wood. Also, please use bug spray but not flammable ones. ●There are some architectures where you can get into and view interiors. We recommend you to wear shoes easy on and off. ●We have free lockers in Visitor Center. Please leave your baggage there. Also, do not bring your umbrella in the architecture. ●Wheel chairs and strollers are available to borrow at the entrance. Please ask the information. The Edo-Tokyo Open Air Architectural Museum is a museum established for the purpose of relocating and reconstructing architecture with historical and cultural value, and passing them on to the future by preserving and displaying them as cultural assets. When taking photographs or filming in the museum, please be considerate of protecting and preserving the cultural assets, and ensure that you do not interfere other visitors as they appreciate and learn about the exhibits. Visitors may be asked to stop taking photographs or to stop filming in the following situations: where any actions that interfere with the management of historical architecture and exhibits, as well as other facilities, are observed; where a visitor is deemed to be causing inconvenience for other visitors by taking photographs or filming when the museum is crowded or for too long a time, or monopolizing a spot for photography or filming even if it is only for a short time; where rules are not being observed. For photography/filming involving models, we may inquire about the purpose of use for the photographs/videos. If the photographs/videos are for commercial use (fees charged), you will be asked to stop taking photographs or filming. Photography or filming that involves attire that goes against public order and decency (attire that exposes bare skin to an extreme degree, attire that could intimidate or cause displeasure to others, etc. ), and/or poses or angles that are not suitable for a public place, is prohibited. Photography or filming that may cause danger to other visitors and to yourself is prohibited. Changing, applying make-up, etc. in the museum’s facilities, including the toilets, is not allowed. The use of stroboscopes, tripods, selfie sticks, etc. in the respective buildings (including City Train) and on the premises is prohibited. Bringing in photography or filming equipment apart from tripods or monopods (such as reflectors, lighting equipment, etc.) is not allowed. Bringing in or using photography or filming props that are deemed by us to be damaging to the reconstructed buildings, fittings, exhibits, facilities, etc., or other visitors is not allowed. Before taking photographs of, or filming, other visitors, please ensure that you approach them and obtain their consent. Please do not touch the fittings, ornaments, exhibits, signboards, panels, etc. in the buildings with your hands. 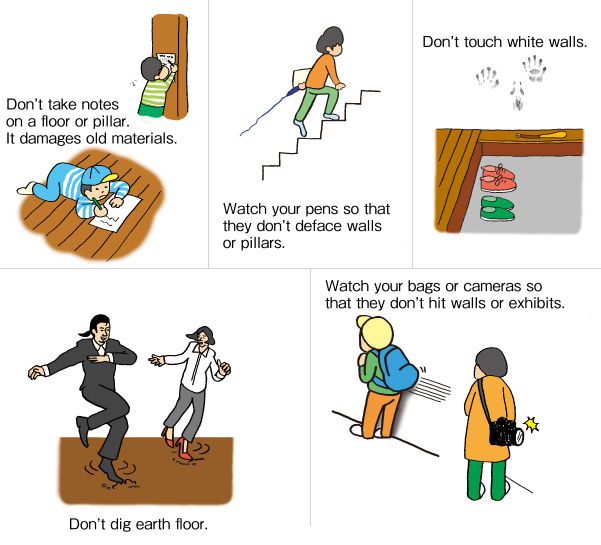 Actions that may damage or destroy the cultural assets are prohibited, such as sitting or leaning on the window-frames, shelves, etc. in the buildings. Please take care to prevent your camera, lenses, etc. from touching other visitors or the buildings, exhibits, etc. Please ensure that you fold up your tripod and/or monopod before moving off. ■Photography or filming at the following places is prohibited for reasons related to copyrights. ■Entering the following places for photography or filming is prohibited. *Your cooperation in protecting the cultural assets and not interfering with tours by other visitors is much appreciated. *It is necessary to apply in advance for photography or filming for commercial purposes. For details, please inquire with the Information desk. The Edo-Tokyo Open Air Architectural Museum is a museum established for the purpose of relocating and reconstructing architecture with historical and cultural value, and passing them on to the future by preserving and displaying them as cultural assets. For this reason, sketching that involves the use of oil paint or acrylic paint is prohibited in the museum in consideration of protecting the cultural assets such as the buildings, and not causing any inconvenience to other visitors. Visitors may be asked to stop sketching in the following situations: where a visitor is deemed to be causing inconvenience for other visitors by sketching when the museum is crowded or monopolizing a spot; where rules are not being observed. The use of posts, ropes, umbrella stands, etc. for sitting or purposes other than their original purpose, is not allowed. Sketching without the use of easels, chairs, or paints (i.e. Pencil sketching, coal sketching) is permitted in each building. Sketching that is deemed to have dirtied or damaged the buildings, etc. is not allowed. *Your cooperation in protecting the cultural assets such as the buildings, etc., and not interfering with tours by other visitors, is much appreciated.